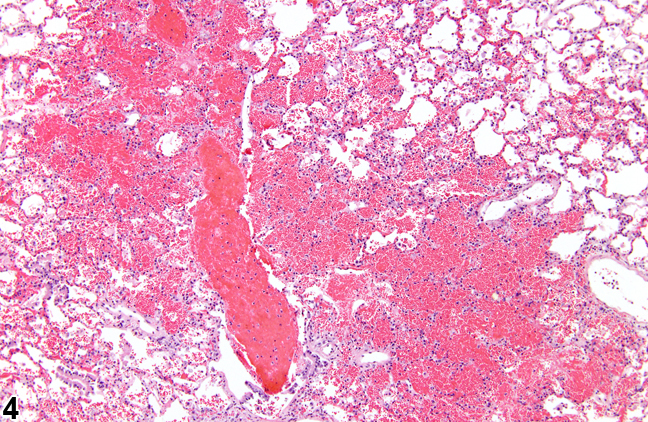 Lung - Hemorrhage in a male F344/N rat from a chronic study. 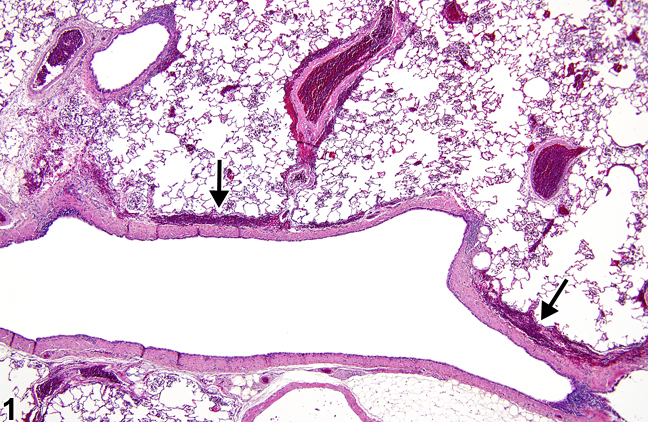 There are small numbers of extravasated erythrocytes around pulmonary veins (arrows). 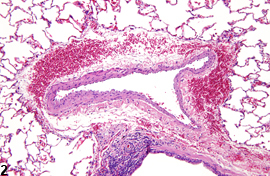 Lung - Hemorrhage in a male F344/N rat from a chronic study (same animal as in Figure 1). Erythrocytes are present in the perivascular space around a pulmonary vein. 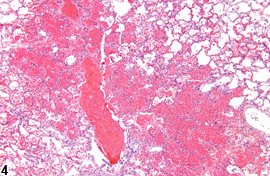 Lung - Hemorrhage in a male F344/N rat from a chronic study. The hemorrhage is associated with chronic inflammation and fibrosis. 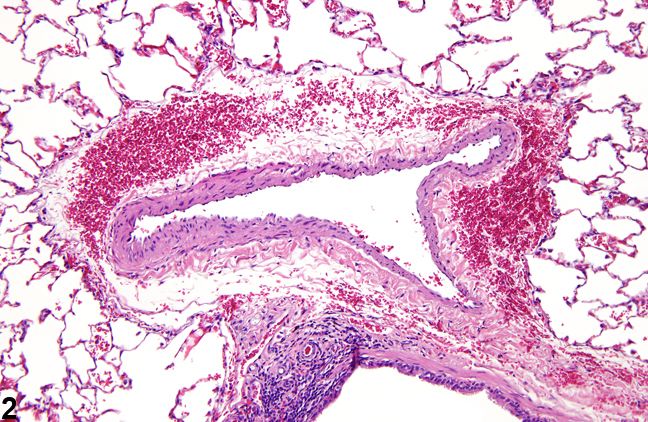 Lung - Hemorrhage in a male F344/N rat from a chronic study. The extravasated erythrocytes fill many of the alveoli. Hemorrhage ( Figure 1 , Figure 2 , Figure 3 , and Figure 4 ) is characterized by accumulations of extravasated blood cells in airways, around pulmonary vessels, and/or in alveolar lumina. Hemorrhage may occur in the lung when there is extensive parenchymal or endothelial cell damage caused by pulmonary toxins. 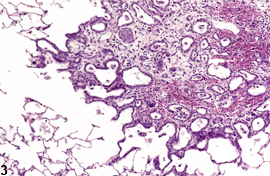 In such cases, necrosis, inflammation, or fibrosis (as a chronic sequela) often is present concurrently. Small hemorrhages can occur secondary to heart failure, which most commonly manifests as collections of alveolar macrophages containing erythrocytes or hemosiderin pigment ("heart failure cells"). Regardless of the cause of the hemorrhage, alveolar macrophages containing erythrocytes (erythrophagocytosis), and hemosiderin pigment are frequently seen amid extravasated erythrocytes. Hemorrhage is frequently observed subpleurally when related to euthanasia with carbon dioxide. In addition, the use of 70% carbon dioxide for anesthesia may induce small areas of hemorrhage in alveoli of rats, which will typically be seen in control as well as treated animals, and no hemosiderin-laden macrophages will be associated with the hemorrhage. Lung - Hemorrhage should be diagnosed and given a severity grade when directly caused by a pulmonary toxicant. Hemorrhage should not be diagnosed when it is a feature of another lesion, such as neoplasia, necrosis, or inflammation, but should be described in the pathology narrative. If, however, the hemorrhage is a prominent component of an inflammatory or chronic lesion, it may be diagnosed at the discretion of the pathologist. Hemorrhage that is secondary to carbon dioxide exposure need not be diagnosed (the pathologist should use his/her judgment in determining if this is the case). If the hemorrhage is not diagnosed, it should be mentioned in the pathology narrative if it has relevance to the study (e.g., if it obscures or confounds other diagnoses). Dungworth DL. 1993. The respiratory system. In: Pathology of Domestic Animals, Vol 2, 4th ed (Jubb KVF, Kennedy PC, Palmer N, eds). Academic Press, San Diego, CA, 539-699. Renne, R, Brix A, Harkema J, Herbert R, Kittle B, Lewis D, March T, Nagano K, Pino M, Rittinghausen S, Rosenbruch M, Tellier P, Wohrmann T. 2009. 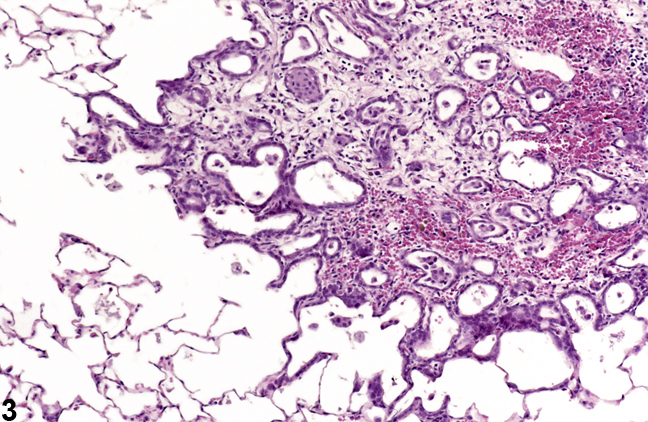 Proliferative and nonproliferative lesions of the rat and mouse respiratory tract. Toxicol Pathol 37(suppl):5S-73S.